Fresh from the launch of their debut album, Fields, in February 2019, Sonic Bothy Ensemble returns to the CCA to perform a programme of new work. 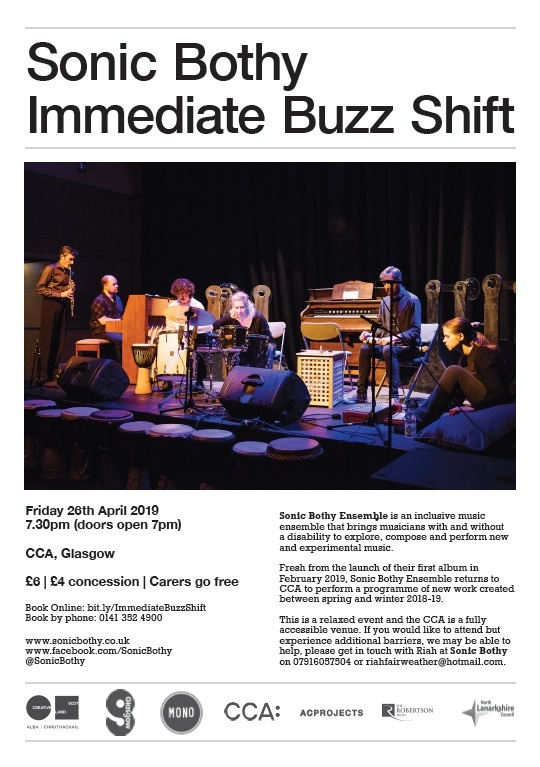 Sonic Bothy Ensemble is an award winning inclusive new and experimental music ensemble that explores, composes and performs in Glasgow and across Scotland. In recent years Sonic Bothy Ensemble has become a regular fixture in programmes at CCA, and Mono, and was the first inclusive ensemble to be programmed at various festivals including GIO Fest, Counterflows and Aberdeen’s sound Festival. Rooted in improvisation and incorporating an eclectic range of influences including electroacoustic, minimalist, jazz, dance, new contemporary music and music theatre, Sonic Bothy’s music is always evolving. The group have become known for their expanding instrumentation, using recognisable instruments such as percussion and piano as well as more unusual items such as found materials and bespoke crafted glass instruments designed by Adam Green and created by Edinburgh-based glass artist, Carrie Fertig. This is a relaxed event and CCA is a fully accessible venue. If you would like to attend but experience additional barriers, we may be able to help, please get in touch with Riah at Sonic Bothy on 07916057504 or riahfairweather@hotmail.com.